informal a place where an object is kept. This is the list of definitions that appear when the word home is typed into the dictionary app on the computer. The first bullet point describes a permanent residence in which someone shares with a family. The fourth bullet point refers to something that represents something or someone’s origins. Both of these definitions relate to Sailors, or according to the online dictionary, a person whose occupation is Sailing or navigation in their own way. Sailors are unique in the fact that they have multiple homes. They have the family and house that make up the home they leave behind while they take to the sea, and they have the ship that makes them who, or rather what they are; Sailors. 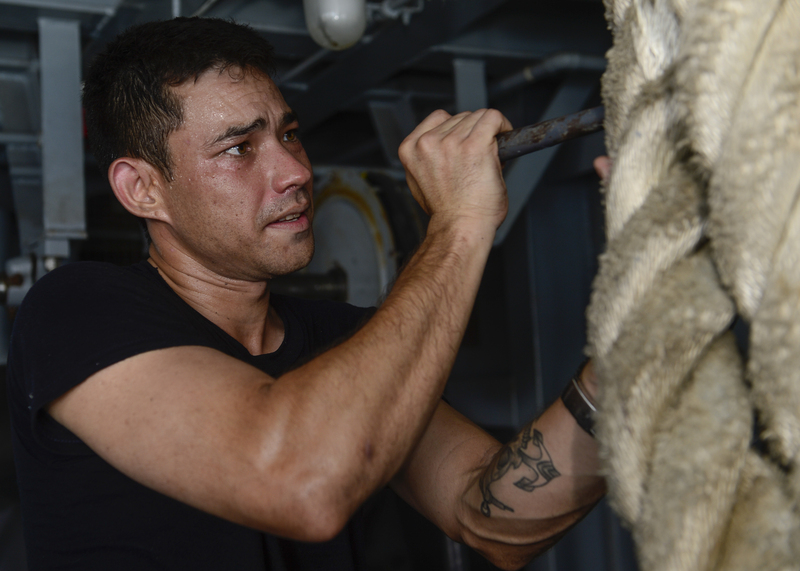 “The maintenance, watchstanding and everything, big or small, that we do on a daily basis at sea all combine to make us who we are,” said Chief Boatswain’s Mate John Parkowski, of North Baltimore, Ohio. The aircraft carrier USS Nimitz (CVN 68) has become the temporary home of nearly 5,000 Sailors. Out on the water is where Sailors put their training to good use, their heritage is celebrated and carried on and their purpose is met. This definition rings true for those assigned to Nimitz who have spent more than a year honing their skills as Sailors and proving their worth. The Sailors aboard Nimitz are currently putting their ability to answer the call of arms to the test as they support combat operations in the Arabian Gulf. This deployment has been a long time coming for these Sailors. Their success and resiliency are a direct result of the countless days they spent underway in the months before they departed on their six-month deployment. Sailors are trained to operate ships at sea, not moored to piers. Nimitz Sailors’ expertise of navigating a ship through the shallowest of waters, launching multimillion dollar jets from the flight deck and monitoring enemy entities from counter defense systems is nearly useless when bound to the shores of the U.S. Although a large percentage of the Navy is serving ashore, their purpose comes from being a part of what makes the U.S. Navy the most powerful in the world. Despite the challenges that can come with being away from land for long periods of time the crew aboard Nimitz are doing what they are meant to do; operate at sea. Every Sailor has a reason why they raised their hand and swore to commit themselves to the patience, situational awareness, momentary adaptability and motivation it takes to serve. They also committed themselves to all the hardships and rites of passage that would one day allow them to truly call themselves Sailors. A Sailor is someone who has met the challenges of missing loved ones during long periods spent on vast oceans, who has accomplished tasks well before the sun has rose above the horizon until long after it has disappeared again and who has innovated and persevered in finding a way of making life at sea a home, away from home.